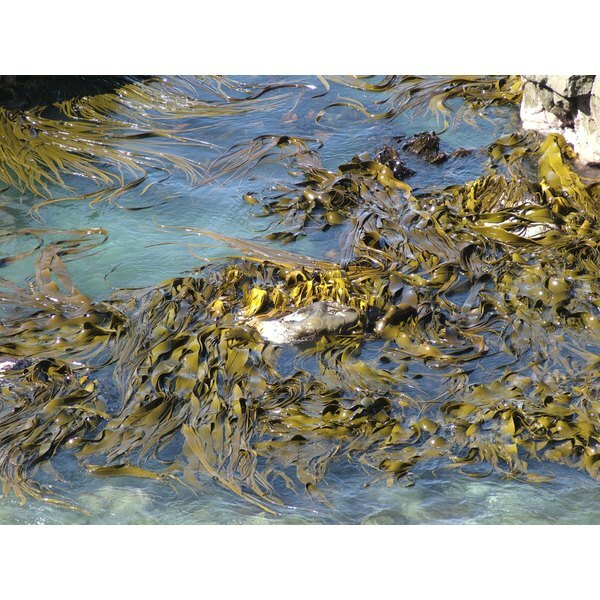 Seanol is the brand name for a type of brown algae called ecklonia cava. Some products contain Seanol or Seanol-F; however, there is little difference in these extracts other than the name. Both Seanol and Seanol-F contain ecklonia cava with additional ingredients. Another form of Seanol, called Seanol-P, is designed to improve vision. Consult your physician before taking any supplements. Ecklonia cava is an edible seaweed consumed regularly in Japanese and Korean cultures. Ecklonia cava is a polyphenol that contains antioxidant and antibacterial properties. Polyphenols are a series of interconnected chemical rings found in your body. The more rings the polyphenol contains, the more free radicals it can capture, which can improve your health. Typical flavonoids have three interconnected rings; however, ecklonia cava contains 10 rings, making it a powerful antioxidant. Seanol and Seanol-F contain ecklonia cava extract, although the exact amounts of the algae are not known. Seanol and Seanol-F are reported to have a number of potential health benefits. Some of the possible benefits of taking Seanol or Seanol-F include weight management, diabetes control, memory improvement and a reduction in inflammation. Researchers have studied the effects of Seanol on vascular health extensively. In a 2003 study published in the “Archives of Pharmacal Research,” researchers discovered that ecklonia cava extract supplementation in rats improved erectile function. However, no human research has confirmed these findings. Seanol and Seanol-F are both ecklonia cava extracts sold in the United States. Different supplement manufacturers use either the name Seanol or Seanol-F to describe the ecklonia cava extract in their supplement, but the same ingredient is contained in each. Seanol is a name trademarked by the Simply Healthy Corporation. Seanol-F is a patent-pending ingredient of ecklonia cava extract in other supplements. The amount of ecklonia cava in various supplements varies depending on the manufacturer. Ecklonia cava is safe with no known toxicity. The only side effect noted with high doses of ecklonia cava was diarrhea in subjects with a preexisting condition related to diarrhea. Seanol and Seanol-F contain other ingredients in addition to ecklonia cava, so read the label carefully for the other ingredients and review potential side effects. Consult your physician before taking Seanol, Seanol-F or any other supplements because they may interact with other medications or conditions.